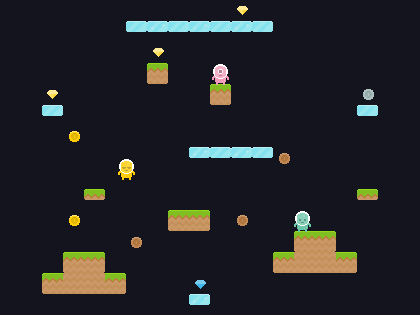 Today I wrapped up and submitted my entry to the January 2016 Lisp Game Jam. You can view my entry and download the source ZIP, or if you have Git you can clone the chicken-sdl2-examples repository. If I do future work on this game, the changes will probably only be pushed to the repository, not the entry page. I am considering trying to make compiled versions of the game so it is less hassle to download and play, but I don't have the energy right now to figure out everything involved with that. I only made a few small changes to the game since my last post. I swapped the player colors around, I fixed a crash when loading a level with a non-integer gravity value, added support for players 3 through 5 (in case anyone wants to try making a level for that), and created a new level, shown here. This level has three players, and reduced gravity so you can jump higher. It is supposed to be set in space or on the moon or something, hence the black background. I didn't have the time/energy to add a display or update the window title to display the players' scores, so you'll just have to trust me that the game is indeed keeping track of every gem the players pick up. I will write up a detailed post-mortem later this week, but now — I'm just going to get some rest!